The REAADS vWF Activity test kit is an ELISA for the quantitative detection of von Willebrand Factor activity in citrated human plasma. The assay utilizes a purified murine anti-vWF monoclonal antibody which recognizes a functional epitope on the vWF molecule to assess vWF activity levels. Results are reported in percent (%) of normal, relative to a calibrator that has been standardized against the third International Standard for Factor VIII and von Willebrand Factor in Plasma (91/666). 3 x 0.5 ml lyophilized Reference Plasma for preparation of reference curve, with assay sheet. 15 ml Stopping Solution (0.36N sulfuric acid). 30 ml Wash Concentrate [33X phosphate buffered saline (PBS) with 0.01% Tween 20]. Note: turbidity may appear in wash concentrate which will not affect component performance and should disappear when working dilution is prepared. VWF:Act Control Plasma. Reconstitute Control Plasma selected for use following manufacturer’s instructions, and store as recommended. Reagent grade water (1 L) to prepare PBS/Tween 20 wash solution, to reconstitute Reference Plasma, and to zero or blank the plate reader during the final assay step. The REAADS von Willebrand Factor Activity Test is an ELISA for the quantitative detection of vWF activity in citrated human plasma. The assay utilizes a purified murine anti-vWF monoclonal antibody which recognizes a functional epitope on the vWF molecule to assess vWF activity levels. Diluted citrated patient plasma and controls are incubated in microwells coated with monoclonal capture antibody allowing patient vWF to bind to the surface. Following an incubation period, the wells are washed, and a horseradish peroxidase (HRP) conjugated anti-human vWF detection antibody is added. After incubation, the wells are washed, substrate is added, and color development is measured in a spectrophotometer at 450nm following the addition of a stop solution. Patient vWF:Act levels are determined from a six-point curve prepared from the reference plasma provided in the kit. Total incubation time is 40 minutes at room temperature. 1. Remove any microwell strips that will not be used from the frame and store them in the bag provided. 2. Assay each reference plasma dilution in duplicate. 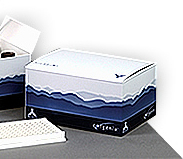 Duplicate determinations are also recommended for patient and control samples. One well should be run as a reagent blank; sample diluent without plasma is added to the well as explained in step 6 of this section. This well is treated the same as a patient sample in subsequent assay steps. A water blank well should be included with each plate; it is to remain empty until 200 µl of reagent grade water is added at the completion of the assay, immediately prior to reading the plate. The water blank well is to be used to zero the plate reader. 3. Using the Reference Plasma provided with the kit, prepare five reference plasma dilutions as described below. * Reference level value to be used for constructing reference curve only. 4. Prepare a 1:21 dilution of each patient sample and control plasma selected for use in Sample Diluent (blue-green solution); e.g. 25 µl sample added to 500 µl Sample Diluent. Mix thoroughly. 5. Add 100 µl of the dilutions (reference plasmas x 5, patient samples and controls) to the appropriate microwells. 6. Add 100 µl of Sample Diluent to the reagent blank well. Leave the water blank well empty. 7. Incubate 15 minutes at room temperature. After the incubation is complete, carefully invert the microwells and empty the fluid. Do not allow samples to contaminate other microwells. 8. Wash 4 times with working wash solution (PBS/Tween 20). Each well should be filled with wash solution per wash. Wash solution in the empty well intended to serve as a water blank will not interfere with the procedure. Invert microwells between each wash to empty fluid. Use a snapping motion of the wrist to shake the liquid from the wells. The frame must be squeezed at the center on the top and bottom to retain microwell modules during washing. Blot on absorbent paper to remove residual wash fluid. Do not allow wells to dry out between steps. 9. Add 100 µl HRP-Conjugated Antibody Solution (blue) to each well (except the water blank well). 10. Incubate for 15 minutes at room temperature. After the incubation is complete, carefully invert the microwells and empty the conjugate solution. 11. Wash 4 times with working wash solution (PBS/Tween 20) as in step 8. Wash solution in the water blank well will not interfere with the procedure. Use a snapping motion to drain the liquid, and blot on absorbent paper after the final wash. Do not allow the wells to dry out. 12. Add 100 µl Substrate to each well (except for the water blank well) and incubate for 10 minutes at room temperature. Add the substrate to the wells at a steady rate. Blue color will develop in wells with positive samples. 13. Add 100 µl Stopping Solution (0.36N sulfuric acid) to each well (except for the water blank well) to stop the enzyme reaction. Be sure to add Stopping Solution to the wells in the same order and at the same rate as the Substrate was added. Blue substrate will turn yellow and colorless substrate will remain colorless. Do not add Stopping Solution to the water blank well. Instead, add 200 µl reagent grade water to the water blank well. Blank or zero the plate reader against the water blank well. Read the O.D. of each well at 450 nm, against a 650 reference filter (if available). For best results, the O.D. values should be measured within 30 minutes after the addition of Stopping Solution. 100 citrated plasma samples from healthy individuals were assayed for von Willebrand Activity using the REAADS kit. 90% of the results for this population were ≥50% activity. Comparable results are seen between the REAADS von Willebrand Factor Activity Test Kit, and another commercially available vWF activity ELISA kit when testing type 2 vWD samples. Using the REAADS von Willebrand Factor Activity Test Kit, the mean von Willebrand Factor Activity for the population is 26.5% with results ranging from 1.7-59.8%. Using another commercially available kit, the population mean was 19.7%, with a range of 1.5-147.3%. When the results were compared, the values reported by the two methods are shown to be statistically similar. Precision within a lot was determined by testing 14 commercially prepared plasma samples, in duplicate dilutions, across three plate lots. The mean CV for duplicates over three plate lots was 5.2%. The precision between lots was determined by comparing the values recovered for eight different control samples on two lots. Each of the eight samples was tested in duplicate in each assay. The mean inter-assay CV was 8.3%. The lower limit of detection, as calculated from the reagent blank plus 3 standard deviations, using 3 kit lots, was 3.1%. Mediates platelet adhesion to sites of vascular injury. Protects factor VIII from proteolytic cleavage in circulation. In von Willebrand Disease (vWD), which is caused by either quantitative (Type I) or qualitative (Type II) deficiencies in vWF, abnormal bleeding may result due to impaired platelet function and clotting factor inhibition. vWD is the most common inherited bleeding disorder, and is clinically characterized by easy bruising or prolonged bleeding from mucosal surfaces.While approximately 80% of vWD patients have Type I deficiency, both quantitative (antigenic) and qualitative (functional) assays may be required for a laboratory diagnosis of vWD. von Willebrand Factor Antigen (vWF:Ag or Factor VIII-related protein) is a plasma protein found in circulation combined by non-covalent interactions with Factor VIII (FVIII:C), a pro-coagulant protein also known as the anti-hemophilic factor. These two proteins show distinct biochemical and functional properties as well as different antigenic determinants; their plasma levels may vary independently of each other. Deficiency of FVIII causes classic hemophilia while deficiency of vWF causes vonWillebrand disease. Most of VWF:Ag is synthesized and stored by endothelial cells while 15-20% is synthesized by megakaryocytes and stored in circulating platelets. A vWF:Ag unit has a molecular weight of about 250 kD and tends to polymerize in circulation, with multimers ranging in size from 850 kD to as large as 15×106 D.
vWF plays a very important role in hemostasis; it protects FVIII from proteolytic cleavage in circulation and helps platelets to aggregate or to adhere to sites of vascular damage. The in vivo half-life of FVIII:C without vWF is shortened from 10-12 hours to a few minutes. These two mechanisms prevent bleeding. von Willebrand disease is characterized by a deficiency or defect of VWF. Decreased vWF activity in plasma can be the result of low concentrations (quantitative or type I defect) or functional changes of vWF (qualitative or type II defect). von Willebrand disease is the most common inherited bleeding disorder and is characterized by easy bruising and prolonged bleeding from mucosal surfaces. The prevalence of Von Willebrand disease has been estimated to be 1-3% of the general population. Greater than 70% of Von Willebrand disease patients have a type I deficiency while approximately 20% have a type II deficiency. The laboratory diagnosis of von Willebrand disease may require both quantitative and qualitative (functional) determinations to differentiate the two predominant subtypes of the disease, type I and type II. The classification of Von Willebrand disease into subtypes is important in determining the course of clinical treatment.